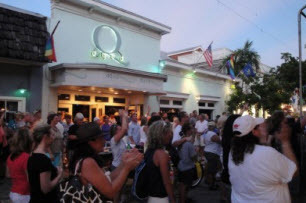 And what better place is there to do just that than on the Island of Key West each September. For over twenty years the week after labor day, thousands of women from all other country gather in the streets and hotels of Key West for a bit of female bonding. At the last count it was over 3,000 visitors, and still it keeps growing year after year. They include women from diverse races, religions, professions and sexual orientations, it is really an eclectic mix of ladies who are ready to party. "One of the exciting things about it, is the varied ages of women that are attracted to the event... whoever it is will be able to find both the perfect way to spend their days, but also their nights," enthuses KWBG Executive Director, Rebecca Tomlinson. And certainly there is no reason to dispute this grand claim as this seven day celebration includes women only water sports, clothing optional parties, adventerous robotic Bull riding competitions are all available for the wild and……anything goes type of woman, whilst if you enjoy your entertainment more relaxed then you wont miss out either with cocktail comedies, concerts and maybe a loving walk in the moonlight. Many events are free, including the Sisters For Brothers” blood drive to compensate for the gay male population not being permitted to donate blood. Discounted party passes are available for groups of events that come at a cost, such as the Old Town Trolley Tour that highlights infamous key west women. Gay male and female guesthouses and mainstream hotels provide accomodationts, and some of the islands 'all-boys' houses (see the accommodations page) become all-women for this week instead. The whole event does not just invite you to spend a few days in Key West , but says "Hey, this is how we live....come and be one of us for the week!" And certainly for the thousands of women who do visit the event, then they like what they see. They must do, as they come back year after year.